1.Prepare outdoor grill for direct grilling over medium heat. Tear four 12 x 24-inch sheets heavy-duty aluminum foil. Arrange sheets horizontally; spray with cooking spray. On right, center of each sheet, evenly divide beans, tomatoes, garlic and leeks; top each with 1 cod fillet. Evenly divide lemon, butter and thyme over cod. Cupping foil slightly, evenly pour wine over butter; evenly sprinkle with salt and pepper. For each packet, fold left side of foil over filling; crimp edges of foil to seal tightly. 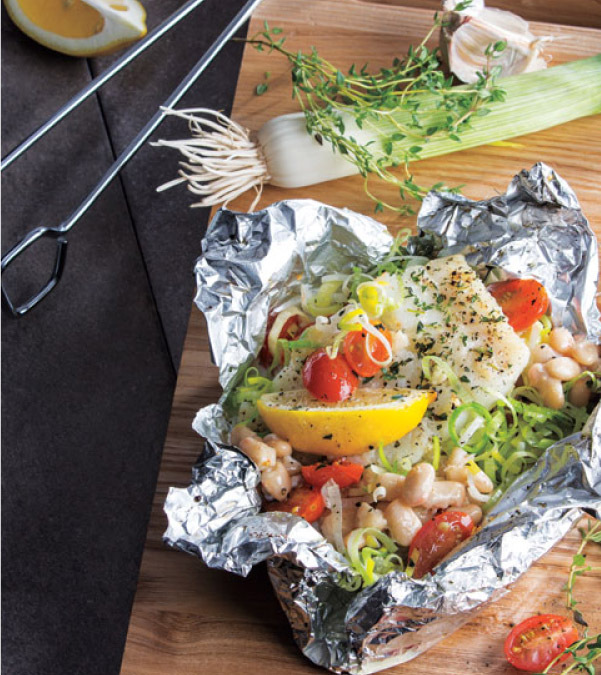 2.Place packets on hot grill rack; cover and cook 15 minutes or until internal temperature of cod reaches 145°. With scissors or knife, cut an ‘X’ in center of packet; carefully pull back foil to open.